A Norfolk artist painting a memorable picture every day of 2018 has so far helped remember a girl killed in the Manchester Arena bombing and a mum who lost her son to suicide raise awareness of the Samaritans. Gill Starkie, from Forncett St Mary, is inviting people to choose an image and a date they want to commemorate. She is then painting the image in watercolours, on the chosen day, in return for a minimum donation of £20 to East Anglia’s Children’s Hospices (EACH). Gill usually paints for between 45 minutes and an hour-and-a-half. She personalises each picture by adding the supporter’s name and a short description of why they chose their date. She admits doing one a day has been a challenge at times, but sitting on her terrace over summer and overlooking nature helped inspire her creativity. For those who ask for a picture, the trained psychotherapist says it can be a very cathartic exercise. 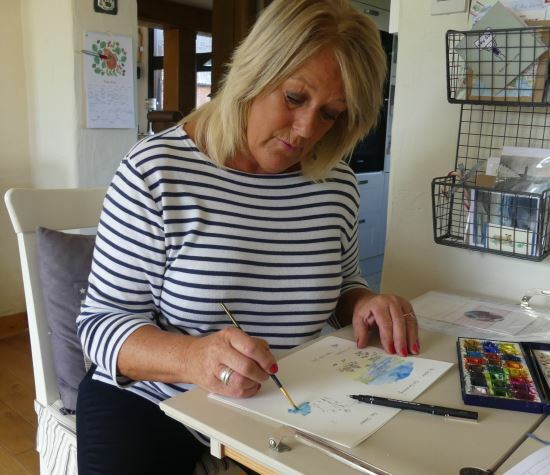 Gill buys the materials she needs to paint herself, meaning she has so far raised some £2,500 for EACH. Any donations of paper or paint would be welcome as she enters the last quarter of 2018. At the end of the year, Gill hopes the collection of images will be printed and bound into a book of thoughts, memories and words, lives captured day by day, page by page. For full details go to www.justgiving.com/fundraising/gillstarkie365paintings. The nook appeal has received a boost of £3,310.45 thanks to Cawston Triples League and Reepham Nomads Bowling Club. Dudley Jones, president of both, chose to support the nook appeal, being run by East Anglia’s Children’s Hospices (EACH) to raise £10 million for the building of a new Norfolk hospice, as his charity of the year. 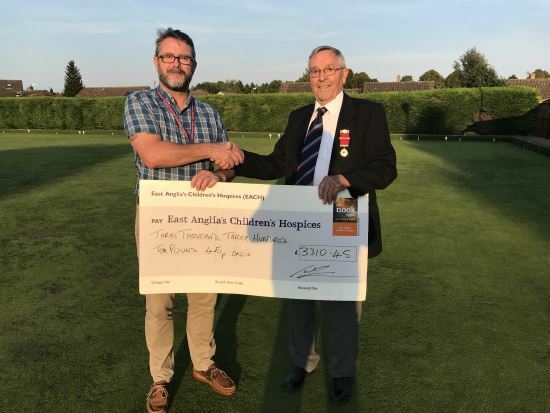 Funds were raised at the league’s annual Presidents Day Trophy competition at Cawston Bowling Club and also from a cheese and wine party at Reepham Nomads. The organisation of both events was led by Terry Hardingham. Building of the new hospice began last November and EACH hopes to have the facility operational by summer 2019. 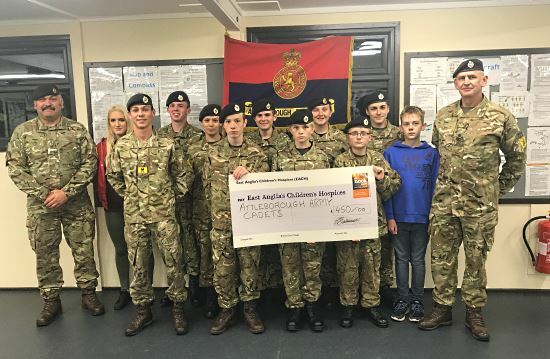 Cadets who packed bags for customers of Attleborough Sainsbury’s have now given £450 to the nook appeal. Members of the Attleborough Army Cadets were welcomed to the supermarket, also supporting the nook appeal as its charity of the year for 2018/19, one day over summer. The nook appeal is being run by East Anglia’s Children’s Hospices (EACH) to raise £10 million for the building of a new hospice in Framingham Earl. Building of the new hospice began last November and EACH hopes to have the facility operational by summer 2019. For more information go to www.each.org.uk/the-nook.